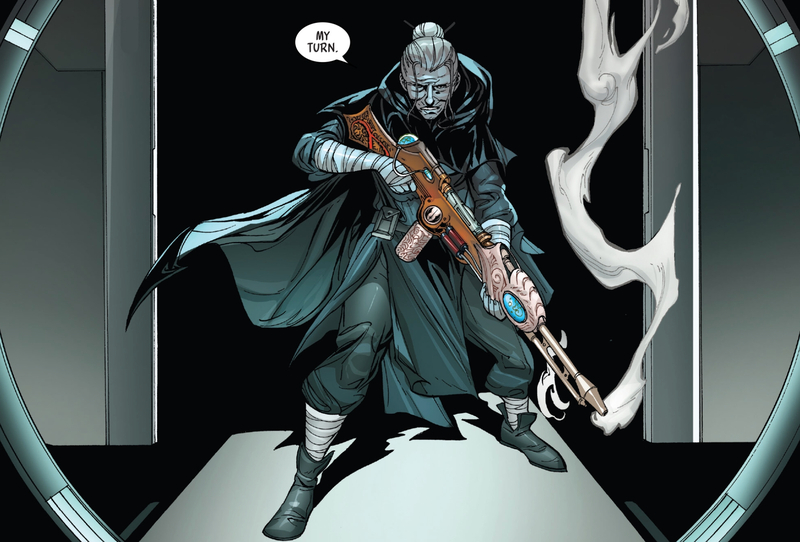 Charles Soule and Giuseppe Camuncoli’s revisiting of Jocasta Nu in Darth Vader 9 is what the Star Wars Expanded Universe has always excelled at — taking a throwaway character from the films and broadening the world around them. Jocasta is best known for her snippy remark to Obi-Wan in Attack of the Clones as he searches the archives for information on the planet Kamino. (“If an item does not appear in our records, it does not exist.”) From this brief interaction, we glean she’s the prototypical schoolmarm librarian type, straight from Central Casting, and that’s all we need in the film; Jocasta plays her part in moving the plot forward, and then we never hear from her again, because why would we? Well, how about because in addition to being the keeper of the Jedi Archive’s greatest secrets, she’s also in possession of an enormous blaster rifle that she uses to ward off Darth Vader like a country granny shooting coyotes from the porch? This is the kind of self-aware silliness the Expanded Universe does so well, its raison d’être, but it took me a long while to appreciate the charms of this approach. I used to not be able to get past the inherent silliness of something like the now non-canon Legacy story of Skippy, the Force-wielding red R5-D4 droid in A New Hope, committing suicide by blowing a gasket after having a Force vision that unless Luke and Uncle Owen take R2-D2 from the Jawas the Rebellion will fail. 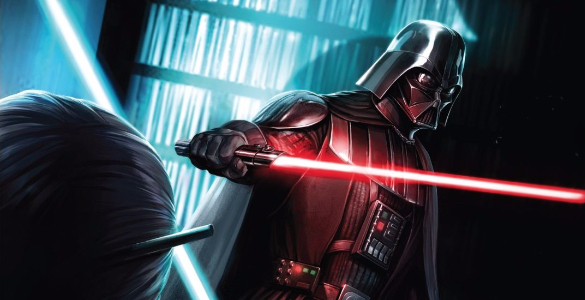 But the beauty of the Expanded Universe, then and now, is that there’s room for all kinds of stories and characters in its world, even silly ones. So, absolutely yes to whatever role Jocasta Nu plays in Darth Vader’s journey to becoming a Sith Lord. 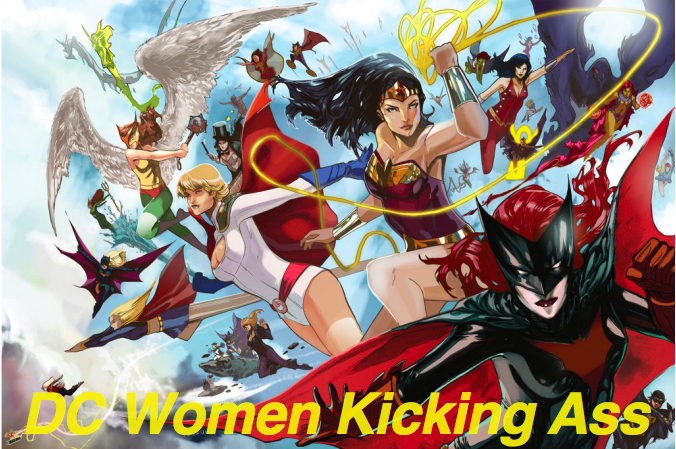 It’s not one I may have ever imagined given her extremely limited role in the films, but good storytelling is all about usurping the audiences’ expectations. Unfortunately, Skippy was never canon, even in the old Star Wars continuity. Old Star Wars had a complex continuity system where things were ranked by importance, but Skippy was one of those stories that was ranked N – Non Canon. Though that didn’t mean there weren’t many other wonderfully silly stories that were canon. Even ignoring the old Marvel Star Wars comics, that were all ranked S (the lowest canon level), there were some wonderfully silly canon stories. Mark, I appreciate you catching all these continuity references in Poe Dameron and Darth Vader. They just remind me that I remember almost nothing from the prequels. I don’t think I’ve seen Phantom Menace since Middle School and the others since High School and all but the most broad memories have been wiped from my mind almost entirely. I honestly don’t know whether I want to jog my memory or not.